Google rolled out the Nexus One with fanfare in January, but sales at Web-only store never took off. (CNN) -- Google's Nexus One smartphone will start being sold in brick-and-mortar stores, said the company Friday in acknowledging that its experiment with Web-only sales has been a failure. "[A]s with every innovation, some parts worked better than others," Andy Rubin, Google's vice president of engineering, said on the company'sofficial blog. "While the global adoption of [Google's] Android platform has exceeded our expectations, the Web store has not." Unveiled in January to much fanfare, the Nexus One offered the choice of "locked" service with T-Mobile or, for a higher price, the freedom to let the user pick their mobile provider. More recently, Verizon was added as a mobile provider for the phone. The phone got largely positive reviews from tech bloggers, some of whom compared it favorably with Apple's iPhone. Tech blog Gizmodo called it "the best Android phone" and CNET said it "greatly enhances the Google Android family". But sales have been sluggish. In roughly the same time it took the iPhone and the Droid, which also runs Google's Android operating system, to sell 1 million phones, Google sold just 135,000 Nexus Ones. Rubin said the online store, which got lots of free advertising on Google's search-engine home page and other Web platforms, remained a "niche channel" for the early adopters who rushed there to pick up the phone -- which sold for $180 with a T-Mobile contract and $530 unlocked. "But it's clear that many customers like a hands-on experience before buying a phone, and they also want a wide range of service plans to chose from," Rubin wrote. He announced that Google will adopt globally the model it's been using in Europe -- combining Web store sales with sales at regular mobile phone outlets. Once in-store availability is established, Google will stop selling the Nexus One online, turning the Web store instead into a showcase for other companies' Android-operated phones. 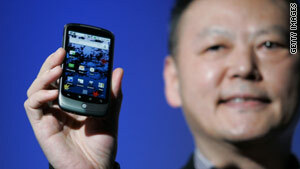 Recently, Google had been pushing Android users to phones like the HTC Droid Incredible. Rubin mentioned both the Incredible, for Verizon customers, and the HTC Evo 4G from Sprint as phones that have benefited from advances made on the Nexus One. Nexus One features include a voice-enabled keyboard, a 3.7-inch touchscreen, five-megapixel camera, Wi-Fi connectivity, an accelerometer and a compass. The company has consistently said the Nexus One, the search giant's debut hardware venture, would be the first in a line of phones.